Bekkedal homes for sale are in close proximity to town, but this is a forgotten fact due to the surrounding forests, tall mountains and secluded properties. 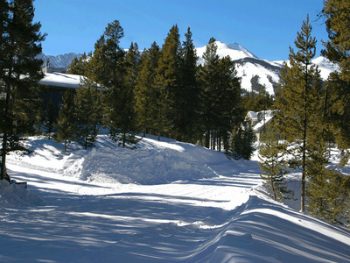 Consider a home for sale in Bekkedal if you want to hike, cross-country ski or enjoy the view from your doorstep, and be able to scoot over to the neighbors’ – to Breckenridge – for a quick cup of culture or entertainment. Bekkedal is just over the ridge from Warrior’s Mark, the southwestern part of town. It’s tucked into a broad bend of the Blue River, in one of the many valleys at the foot of the Ten Mile Range. Directly west, Peak 10 is visible, and east, across the Blue River, one can see Boreas Pass and Baldy Mountain. Read more about the peaceful seclusion offered in the lovely subdivision, or browse our Bekkedal real estate listings below to see properties on offer. Of the 60 parcels in Summit County assigned as Bekkedal in 1961, two are reserved as a common open space for the use of all homeowners. These lie along the Blue River and come with private fishing rights. Nearly all the remaining lots are more than an acre, and some are close to four. Many stands of spruce, Ponderosa and Lodgepole pine add to the privacy and seclusion of homes in this neighborhood, but good sun exposure is not difficult to find. The terrain varies, lot by lot, and so does the architecture. Small and large homes coexist, here, and all are unique. The architectural style of homes for sale in Bekkedal can range from ski-chalet quaintness to contemporary mountain sophistication. Bekkedal is not incorporated in either of the neighboring towns of Breckenridge or Blue River, so it falls under the county’s purview. The covenants allow short-term vacation rentals with few restrictions, but not B&Bs. The big lots, natural seclusion and closeness to town is why Bekkedal appeals to year-round residents and vacation homeowners. An expert from Breckenridge Associates would be happy to talk to you about Bekkedal homes for sale. Call (970) 453-2200, or message us online now!